Many of us are busy preparing food and gathering supplies in case of a natural disaster or other catastrophe; and we seriously believe it is in the best interests of our family to do so. But what about our friends and extended family? Can we help them to prepare also? Would we share with those not prepared? Would we turn them away because they refused to prepare when we tried to tell them they should? Can I store enough for my extended family? Can I afford to? I was asked these questions lately by Jane, one of my readers. I have also ask myself these questions pertaining to my own extended family. I need help with helping friends, family, and extended family prepare. My immediate family (in our home) is fine. Friends, family and extended family seem impressed with our preparations (or are they just humoring me?) and mentally on board with the concept ("I know I should, but...."), but they are too busy, it's too overwhelming, it's too confusing, they don't know where to start, etc. buy an extra can of soup, etc. whenever you can. Nothing that costs a lot, nothing that's "too much work", just things that are part of their normal routine. They never do anything and I am stressed because I know that these are the folks who will show up on my doorstep when something happens and expect me to bail them out at the expense of MY family's long term prospects. Do you have any ideas on what I can say or do? My response to her included these ideas. See what you think. I know exactly what you mean, but here's the thing: All humans have a "normalcy bias" to one degree or another. I have a lot of it, but it depends on the subject. For me it's illnesses (can't happen to me), but not preparedness — I'm all in on this (as you can tell). That normalcy bias means that we don't want to admit or we don't believe that bad things can happen, or will ever get that bad, or that bad things can happen to us. And if they do, things will always get better. And that may be true — or not. The normalcy bias is a survival mechanism that our brains have when we are faced with something traumatic or just the idea of something traumatic. We all expect life to go on as it always has and our brains are wired to accept that and nothing else, unless we can convince ourselves to believe differently. So our friends and family have varying degrees of this bias. You cannot change them. People believe what they want to believe. For instance, the people in New Orleans who would not leave before or during Katrina, believed it wouldn't be that bad. When the hurricane is announced, many believed they could ride it out just fine. How many people run to the store to buy whatever when a hurricane is approaching because they have nothing in storage? Didn't think they needed it because the store will always be there — right? All you can do with your friends and family is what you are doing now. However, at what point should you give up trying to help them or convince them? I will tell you that my grown kids do not think much about preparing. They are well aware that I am prepping because all their birthday and Christmas presents are preparedness items. They got the hint - but still do nothing about it. When (or if) we should give up on them? If they think you're crazy for stocking up? If they are the kind of people who refuse to become informed about what's going on in the world? If they become depressed hearing about the state of the world or discouraged about preparedness because it's SO overwhelming so they would rather spend time chatting about the latest Dancing With the Stars contestant? Whether we should or shouldn't give up on them is a personal and individual decision. Then there's the issue of security — yours. It might be better, for security's sake, to stop trying to convince those people and just keep it to yourself. If they don't know what you have, there is less chance of them coming to you for a bail out when something does happen. 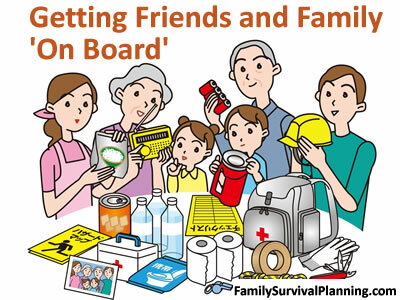 It's okay to go the preparedness route alone with just your immediate family. Tuck away the things your family needs and keep it to yourself. If or when something happens that your supplies are needed, that will be the time to decide how much you want to share and with whom. I do advise, however, that we communicate and plan with neighbors or friends who are also concerned and preparing. Get involved in a first response organization in your community, like C.E.R.T., and any other like-minded organization. If there is a significant catastrophe, we will need each other. No one can fully prepare for all possibilities. This is the best I know how to answer. What and with whom to share will be a tough decision if any of us who are prepared have to make it. Where are you going to put your food storage?